A Northern Ireland council has been criticised for allowing a memorial seat at a leading loyalist's graveside. Mark Fulton, a former leader of the Loyalist Volunteer Force, died in 2002 and is buried in Kernan Cemetery, Portadown. On Monday night, Craigavon councillors voted to allow his family to put a memorial seat beside his grave. SDLP councillor Dolores Kelly said the decision was "an obscenity" and would refer it to the Equality Commission. "They have now lost all moral authority in relation to memorials in general and indeed the needs of victims," she said. She said those in the council area who would be glad to see the decision would be "few and far between". However, Craigavon mayor Robert Smith of the DUP, said Fulton's family may have been able to take their case to the Equality Commission if they had been refused permission for the seat. He said the memorial contained a simple inscription with no reference to any paramilitary organisation. "If there was something on that inscription that said 'volunteer' or was a memorial to a terrorist or anything like that I certainly would not be approving it," Mr Smith said. Fulton was a close associate of the LVF's founder Billy Wright. 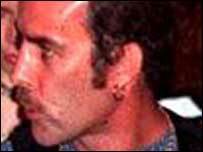 Among the victims of the terror group in mid-Ulster was Adrian Lamph, a Craigavon Borough Council worker who was shot at a council yard in 1998. A request for the erection of the memorial came from Fulton's family earlier this summer. The 47-year-old was found dead in his cell at Maghaberry while on remand accused of conspiracy to murder another man during a bloody feud between loyalist paramilitary groups.